Enjoy the look of custom framing at a great value with our Profile frames. These refined frames are assembled by a family-run company in Ohio where the care that goes into each one is as special as the photos or artwork you choose to put in it. Artisans carefully select lengths of solid ash then meticulously craft the frames, using miter joints that are secured by hand with wood glue and nails for extra stability. Uniquely proportioned white mats complete the classic, gallery-worthy appearance. Whether used solo or as a part of a wall gallery, Profile frames create a timeless display. The artisans at this sister-owned and -operated Ohio company use a combination of technology and hands-on work to craft high-quality frames and custom framing for fine art. Place the frame face down on a flat, protected surface. Remove the backing board from the frame. Position your image in the mat window opening. Secure image to the mat or backing board with the included linen tape to keep it from shifting (optional). Simply peel and stick. Place the backing board in the frame, on top of the mat. 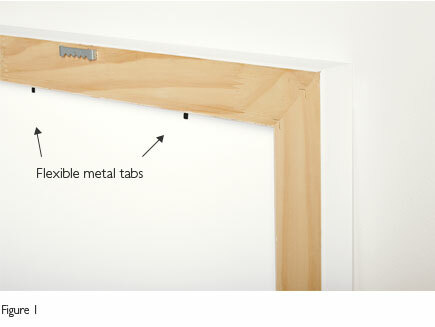 Using a flat-blade screwdriver, gently bend the flexible metal tabs back to their original position to secure the glass, mat and backing board in the frame. Hammer the nail 3/4 of the way into desired wall location and hang frame so it's flush against the wall.